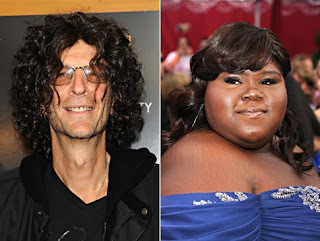 The Urban Politico: Leave Gabourey Sidibe Alone! I'm going on record saying that it is not okay to talk about Gabourey Sidibe as if she is not a human being with feelings. She is young and has a wonderful personality and just got nominated for an Oscar for her first movie ever, Precious. First it was Howard Stern. Who, you know, should really be talking about someone else's looks because he looks just like Brad Pitt...oh wait. Is it really necessary for these men to talk about this young girl in such a horrible way? It's makes me want to throw my computer monitor! First, of all is it healthy to be overweight? Hell no. No one is saying that. But while we are on the topic of health, is it healthy to look like this? These Victoria Secret models who I guess are supposed to be the standard of beauty we are all aiming for look like they haven't eaten a meal in weeks! And I'm going to let you draw your own conclusions as to how the two Hollywood "actresses" or whatever it is they do below got to be so thin. Hint: It ain't from marathon training. Who do you think it is Gabby or these skinny snitches who are living the more unhealthy lifestyle? Don't get it twisted, the white Hollywood standard of beauty (being a size 0 to a size 2) is completely unrealistic for most women and it's not a coincidence that you hear about models and actresses dropping dead. You don't get to be this skinny because you do pilates. Let's not kid ourselves! I don't want to seem like I am condoning overeating and lack of exercise. But some of the people who are overweight are that way because of genetics. Some. These chicks above are not 80 pounds because they got lucky in the gene pool. Also, which one of the skinny chicks above has actual discernable talent? (And no Lindsay Lohan child actor doesn't count. Anything she did before 18 is off limits). I also get the sense that all of the people who are talking mess about Gabby didn't even see the damn movie she was in because an important theme throughout the movie is Precious' self esteem and fantasizing about Hollywood. It is a damn shame people have to criticize someone who doesn't deserve it in order to make themselves feel better. Howard Stern is increasingly irrelevant since Glenn Beck and Rush Limbaugh became the hottest shock jocks in the past few years. Jamie Foxx should know better. You have a daughter Jamie AND your sister is overweight with Down Syndrome. People make fun of her. Don't do the same to Gabby.